A few months ago we were approached by Mitch and Sabina Dawson about revamping their digital presence. They had purchased the company in 2012, and they had evolved the business from office furniture solutions to a more consultative office space design business that focused on the concept of The Living Office. Update – Read the full Raven Studio case study. The Facility Resources branding would be replaced with a new brand called “Raven Studio“, their pitch was that they wanted a slick, bold and refined website that reflected this new mantra. The Facility Resources site was very old and had not been updated in 5 years. It wasn’t mobile responsive, and it wasn’t reflective of where their business was today. The old site didn’t have many calls to action to encourage a potential client to get in touch with the team at Facility Resources, and served mostly as a catalogue of things. Worst of all, there was no way to update the site, it was built on old technology, and was using a proprietary Content Management system that a previous web vendor had installed. Over the years, everyone had forgotten how to log into that system, and as a result, the site sat dormant. First up we focused on a digital strategy. We reviewed competitors, we looked at their brand strategy which had already been developed for Raven Studio, and we investigated their expansion plans. We came up with a series of recommendations, and a phased approach of starting with a solid digital presence supported by a LinkedIn relaunch, and a variety of future lead generation attributes which could be easily added to the website over time. Sabina and Mitch really wanted something turn-key that they could update in the future without hiring a development team. We used WordPress and the Divi framework, our preferred solution for client focused websites. WordPress is an open source content management solution that currently powers approximately 25% of the internet. Divi is a theme framework which lets designers set up page templates, and allows end users simplified tools to update their website. More importantly, both WordPress and Divi are under active development, which means they are both always improving, and are getting constant security updates. NorthIQ has used both extensively, and we have a good system in place for creating sites that our clients can update after we hand over the keys. We are in the process of writing a brief WordPress manual called “I have a shiny new website, now what? Tips and tricks for maintaining your new website.” If you sign up for our bi-weekly updates, we’ll send you our new guide when it is out. We came up with a quick wireframe design, and a pitch for the website. Working alongside a colleague, Sean Robinson, we came up with an overall look and feel, and passed that to Sabina and Mitch for review. In the meantime, Sabina undertook the arduous task of writing every single page of copy for this brand new website. She also provided us with incredibly high quality, beautiful photography which really inspired and informed the website. Great pictures really do make or break a website, and Raven Studio has some of the finest photos available. The site doubled in size from our initial estimates, and we ended up building a number of different templates. As we were developing the site, Raven Studio also acquired a new territory, so we were able to include that in the relaunch. We built specific areas of the site around the concept of the “Living Office”, and used the beautiful photography to highlight the amazing things that Raven Studio can do. Herman Miller’s photography is also beautiful, and we used that liberally throughout the site. We highlighted a number of different products that Raven Studio offers, and we’ve used the amazing studio shots that Herman Miller provides to give a clean, “Apple inspired” look and feel to the site. 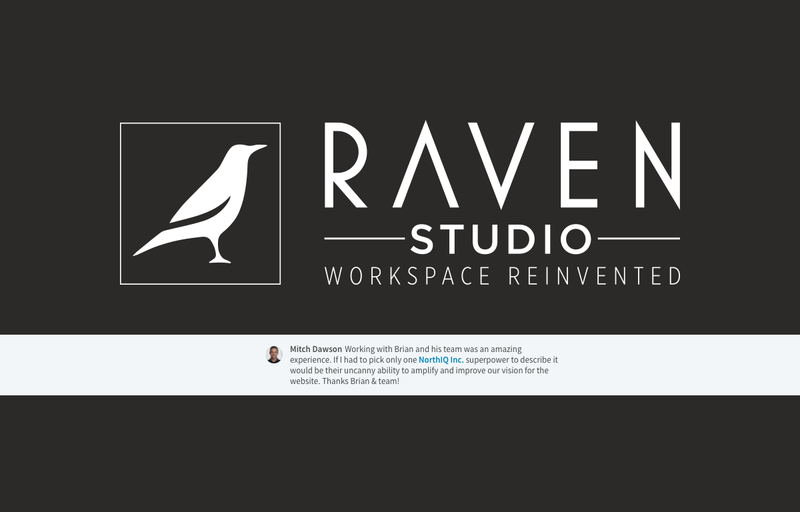 After a lot of building, a ton of tweaks and clean up, and some final polish, Raven Studio was ready to launch to the public on Tuesday August 8th. We turned it on, sent out an update, and waited. In the two days since the site launched, it has seen 5x the usual traffic. We worked with the team at Raven Studio to update their LinkedIn profiles, and created a new company listing for Raven Studio on LinkedIn. We posted the initial update, and watched how the server handled the traffic for the first day. Over the next few days, we will continue to monitor how Google is crawling the site and how users are interacting with it, and we will make some minor adjustments to address any issues we may find. The launch was an incredible success, and is a testament to how having a strong digital strategy can act as a roadmap to a successful website launch. A huge thanks goes to Mitch and Sabina Dawson for working with us in a true partnership to launch this fantastic website. Working with Brian and his team was an amazing experience. If I had to pick only one NorthIQ Inc. superpower to describe it would be their uncanny ability to amplify and improve our vision for the website. Thanks Brian & team! How can NorthIQ help you? Contact us today and we’ll help you develop a cutting edge digital presence that will get you noticed, and get you more customers!